The team behind the Airspy have given us permission to give away three Airspy related prizes for the New Year Holidays! 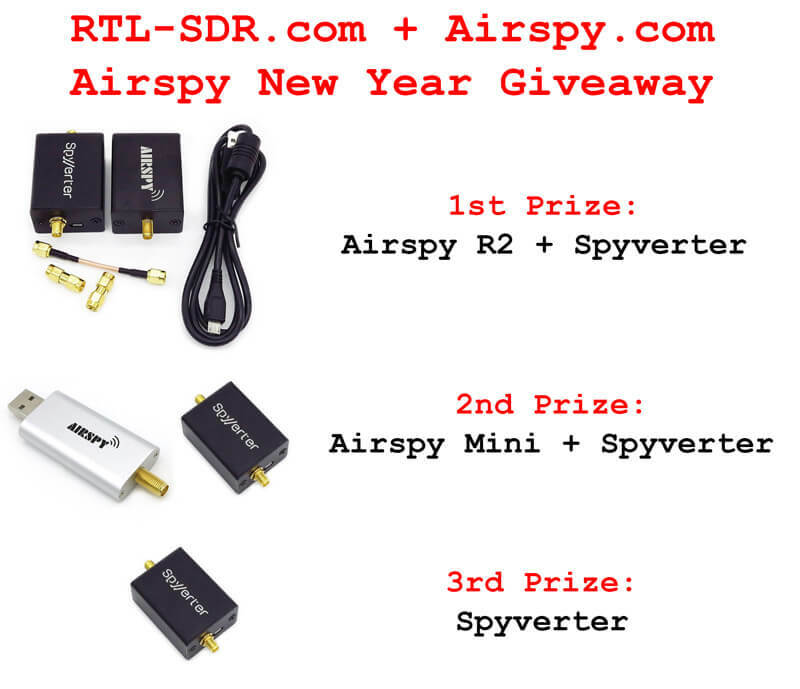 The first prize is an Airspy R2 + Spyverter, the second prize is an Airspy Mini + Spyverter and the third prize is a Spyverter. The Airspy is a high performance yet low cost software defined radio with a 12-bit ADC and tuning range between 24 – 1800 MHz. It is an attractive device as its dynamic range exceeds all other SDRs in a similar price range. Its performance begins to approach that of the very high end expensive SDRs. High dynamic range means that weak and strong signals can coexist in the received spectrum without any overload occurring. We have previously written reviews of the Airspy R2 and Airspy Mini on our blog. The Spyverter is a high performance upconverter that allows the Airspy to tune to LF/MW/HF frequencies between DC – 30 MHz. The Spyverter perfectly compliments an Airspy device as it is also a very high dynamic range device. It also works perfectly with the bias tee on our RTL-SDR.com V1/V2/V3 dongles. We previously reviewed the Spyverter here. More information about these products can be found at airspy.com. Competition is now finished. Winners will be announced and emailed shortly. Thanks to all who entered! I’d love to finally get into the HF band! The winners were randomly selected using random.org, and all have now been emailed. If you’re a winner, please check your email and spam folder just in case. Thank you all for participating! It’s really great to see all the variety in what projects people are doing. There were about 500 valid entries resulting in about a 0.6% chance of winning. Keep an eye out for future contests! Simply make a comment on this post explaining what you’d do like to do with an Airspy or Spyverter if you won one. PLEASE MAKE SURE TO ENTER YOUR EMAIL ADDRESS IN THE COMMENT FORM. The address will only be visible to us, and we promise not to use it for any other purpose. Rules: The winners will be selected at random. One entry per person only. You must legally be allowed to receive the prize. Draw closes in one week on 3 January 2017, 11:59PM UTC Time. Thank you all for entering, this comment marks the end of the competition. The winners will be announced on this post and the Airspy team will email you shortly. I work in law enforcement so I would use it to recieve body wire frequencies and record them. The filters available in SDR sharp have made me look like a rock star at the office as they are applied on the fly as needed. Great, I can use it as a Software Spectrum analyzer to adjust ham radio pass-band filters and cavities for repeaters here in Cuba. I would like to win a airspy to wedge the door to keep the wife out,seriously to work the satellites. I would like to receive DCF77. I would use it to upgrade my current rtl-sdr equipment. It would be a major upgrade. I want to catch all the EM waves!! I would love to use one of these SDRs in my research to find hidden talk groups on the local police system. I’ve been experimenting with different antennas but I’m still using a cheap RTL-SDR. I’d love to win so I could upgrade my current setup to better track aircraft. It’d be great to grab some weather data too! Been wanting to try an Airspy that will probably replace my SDRPlay. long I wanted to do radio monitoring and tracking satellites. great initiative. My constant obsession are Aviation and Weather related radio waves. But most of all, I have decided to give a try to building antennas, starting with a turnstile for NOAA reception.